When most of us think of bees, we think of honeybees. However, honeybees are just one of many species of bee. Two other types of bee are Mason Bees and Leafcutter Bees. These species do not construct communal hives, instead they fashion individual homes in what are known as bee houses or bee condos. A bee house is a shelter in which the bees can burrow into tunnels and construct nests. Both bees and humans can benefit from bee houses. The bees have a safe environment in which their larvae can develop. In these sunny, warm burrows, the young are protected from destruction by wind, rain and predators, such as birds. We, in turn, reap the benefits of having a local population of bees. While not honey producers, they are important pollinators. By introducing and managing bee houses, we introduce and manage pollination. By doing this we can increase the quality and quantity of our food crops. This is particularly beneficial for farmers growing single crops on a large scale. Back yard gardeners shouldn’t overlook extending an invitation to these little workers, either. You will have bigger and better tomatoes and more beautiful flowers. And no worries, bees who use bee houses are non-stinging. 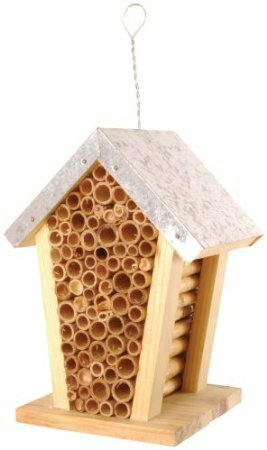 Bee houses retail from $12.00 to $75.00, with the majority falling in the price point range of $25.00 – $30.00 range. However, they also make an excellent DIY project. By re-purposing a drawer from an old bureau, or chest of drawers, and non-treated wood blocks, dry logs or dried stems, such as bamboo, raspberry or brambles, a bee house can be constructed for little to no money. Happy bee keeping!